When I was a child, I could not wait for Christmas morning. It was such a magical time in my life. All I had to do was get up, put my robe on, and walk downstairs to the basement to see a beautifully decorated tree with a bunch of wrapped presents lying underneath it – enough for my 3 siblings and myself. Fast forward to me now being THAT Mom who desperately wants to create this same sense of magic for her own child on Christmas morning, while at the same time being fully prepared with at least a few Christmas morning breakfast ideas. The morning usually starts out around 6:00 am because our son is an early riser, especially on Christmas morning. I’ve usually had less sleep than normal because I stayed up late the night before finishing up wrapping presents, setting out Santa’s cookies and milk, and preparing for the long day ahead of traveling to several places throughout the day, spreading our Christmas cheer (ahem, a little sarcasm there). The last thing I normally think of is what to make for breakfast on Christmas morning. Something that will fill us up and give us a good foundation for the rest of the day, which normally consists of picking here and there on cookies, appetizers, sodas, and candies. 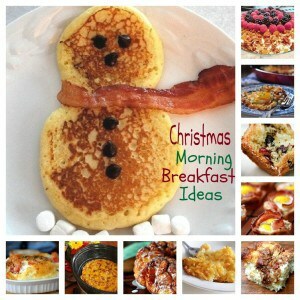 After perusing the internet, I found 10 Christmas morning breakfast ideas. I purposely chose a variety to suit everybody’s tastes. As a matter of fact, I will most likely make 2 or 3 of these on Christmas morning. Heck, who am I kidding? I’ll be lucky enough to make one. But in the ideal world, I will have my Christmas apron on, holding a tray of just-out-of-the-oven-goodness, greeting my sleepy-head family as they awaken. This first one is perfect for my son. This is a Pancake Snowman that I found on this site Pretty Pink Tulips. He loves pancakes and he loves bacon. Can’t get any better than this for him. There is no recipe, but it is pretty self explanatory. You can even use the frozen pancakes to make it easier and quicker to make. 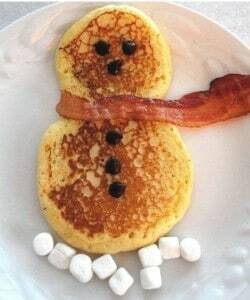 Use the cooked bacon as the scarf, the mini marshmallows as the snow, and chocolate chips as the eyes, nose, and buttons. Very cute! This next one comes from a site called This Mama Cooks! Love the name. This is a Breakfast Granola Parfait. 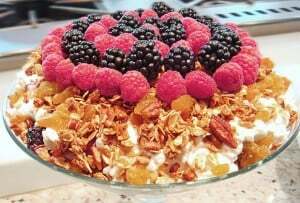 It has everything needed for a healthy, filling breakfast – fruit, oats, nuts, coconut, honey, raisins, cottage cheese, and berries. My first impression was that this recipe used yogurt. You can substitute yogurt for the cottage cheese if you’re not a big cottage cheese fan. Either way, it’s a great healthy breakfast to get your day started right. My 3rd Christmas morning breakfast idea I believe is my favorite, not only because I love a good hearty breakfast but also because of the way this particular blogger describes how to make it. It’s really funny. 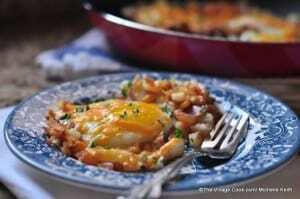 It comes from a blog called The Village Cook and is called Skillet Breakfast. It calls for red potatoes, bacon or ham, eggs, colby jack cheese, sour cream, and chives or green onions. This isn’t part of the recipe, but I’d be willing to substitute corned beef hash instead of the bacon or ham. Mmmmmm! I wish I had some of this right now. 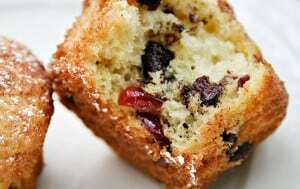 This next recipe comes from a blog called Ezra Pound Cake and is aptly called Christmas Morning Muffins. These you could make the night or even a couple nights before Christmas morning and just set them out on a plate while everybody is getting ready for the day’s festivities. Dried cranberries and chocolate chips are inside and the topping is made of cinnamon and sugar. Yum! Oh my goodness, this next recipe looks so very good! I like the idea of a full hearty breakfast that can be eaten like a muffin. Just pop it in your mouth. No need for a fork! 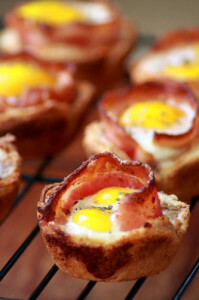 This recipe comes from a site called The Noshery and it is called A Two Bite Breakfast: Bacon & Eggs in Toast Cups. All it calls for is bread slices, bacon, eggs, shredded cheese, and salt & pepper. Can’t get much easier than that. Just use a muffin tin and you’re good to go. How clever can you get? 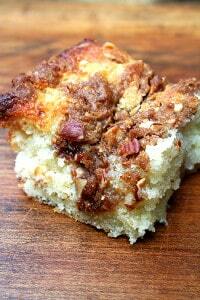 So you can’t have a collection of breakfast ideas without including coffee cake! This particular recipe is called Best Coffee Cake Ever! How could I resist posting this one? It comes from a site called Alexandra Cooks. Based on the name of this recipe, I expected there to be some very exotic ingredients and some fancy baking methods involved, but it is really very simple. If you view her pictures of this coffee cake, you will be sure to want to make it yourself. My 7th Christmas morning breakfast idea involves hash browns. I literally could eat hash browns every day, all day, morning, noon, and night. That’s how much I love them. 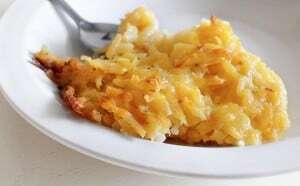 This recipe is called Hash Brown Casserole and comes from the same site that has the Christmas morning muffin recipe, Ezra Pound Cake. This hash brown recipe calls for cream of chicken soup, colby jack cheese, butter, onion, frozen hash browns, chicken broth, butter, salt & pepper. I am sure this must be heaven on a plate. Yes please! This next recipe is called The Best Monkey Bread. 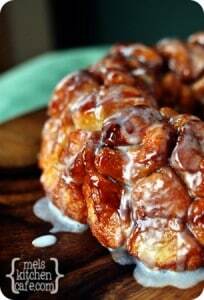 Monkey bread? I have never heard of monkey bread and it honestly doesn’t sound very appetizing. However, a friend of mine just this past weekend told me how delectable monkey bread is, so I had to find the recipe and include it in this post. 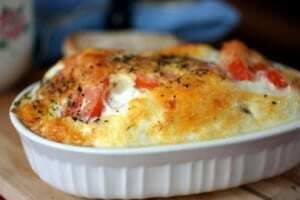 This particular recipe comes from a site called Mel’s Kitchen Cafe. It’s like a big ole sticky cinnamon roll in a bundt pan. It looks a little more time consuming to make than my other recipes, but the end result looks to be well worth it. Love, love LOVE using my crock pot any chance I can get. The upfront work is so worth it. Normally whenever you hear about a crock pot recipe, it’s something for dinner, but this one is for breakfast and cooks overnight while you sleep. It’s like Santa Clause leaving you breakfast on Christmas morning. 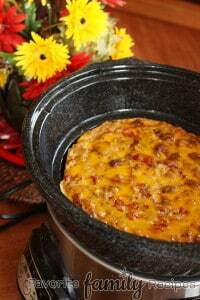 This recipe comes from a site called Favorite Family Recipes and is called Crock-Pot Breakfast Casserole. It calls for sausage links, eggs, milk, potatoes o’brien, a tomato, shredded cheddar cheese, and salt & pepper. Just get up and eat! And the very last of my Christmas morning breakfast ideas comes from a site called Naturally Ella, called Breakfast Egg Bake. Mmmmmm, looks like heaven in a ramekin! This recipe isn’t specific. Ella (the writer) just says to throw in whatever you might have (her example is turkey, tomato, and onions), sprinkle with cheese, and add enough eggs to cover. Looks like she sprinkled some parsley on top. It’s a beautiful presentation for something that is literally thrown together. So there they are! My top 10 Christmas morning breakfast ideas. I hope they’ve inspired you as much as they have inspired me to do more for Christmas morning breakfast than to just grab a couple leftover cookies that Santa didn’t have time to eat. If you make one or two of these recipes, it will start your morning off right and you will be more physically able to handle the festivities this day has to offer you.